George Washington Carver was born in Diamond, Missouri, in 1864. 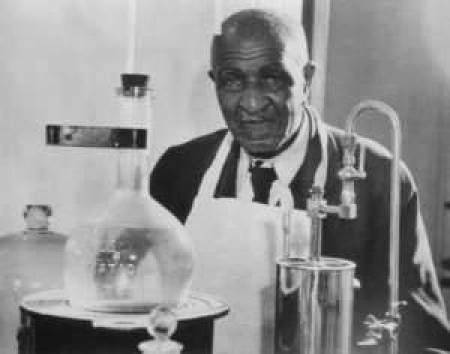 He researched crops such as … Expand ▸George Washington Carver was born in Diamond, Missouri, in 1864. He researched crops such as peanuts, soybeans and sweet potatoes, which aided nutrition for farm families. He wanted poor farmers to grow these crops both as a source of their own food and as a source of other products to improve their quality of life. The George Washington Carver Fellowship for Doctoral Studies seeks to attract and support underrepresented scholars into doctoral degree programs in the College of Agriculture, Food and Natural Resources at the University of Missouri. The fellowship honors George Washington Carver, a native Missourian, who gained international recognition in the early 20th century for his teaching and research in agriculture. The fellowship is awarded to the most highly ranked fellowship nominee who is a U.S. citizen, newly accepted into a CAFNR doctoral degree program and a member of an underrepresented ethnic minority population (African American, Native American or Alaska Native, Hispanic or Mexican American). The nominee must have and maintain a 3.5 GPA and make continued satisfactory progress toward the degree. $5,000/annum to the fellow for up to five years (subject to annual review of progress toward the degree). The fellowship package will NOT cover the Waiver of Educational Fees, Graduate Medical Insurance Subsidy and other incidental costs (e.g., the student recreation center). Student’s commitment as shown in student’s personal statement and letters of recommendation. A nomination letter by the major advisor that addresses the student’s potential for academic success in the classroom and in research. Will be composed of a Director of Graduate Studies or Director of Graduate Admissions from each of the college’s academic divisions. The individual will be appointed by the Division Director and serve until replaced by the Director. The committee will evaluate each candidate and identify those deemed to have the potential to be an outstanding doctoral candidate. Those candidates will then be ranked by the committee. The Selection Committee will notify the Associate Dean for Research of its decisions and ranking of candidates by 28 February. The Associate Dean will notify each nominee, their advisor and Division Director of the committee’s decision. Normally one fellowship will be awarded each academic year, assuming an acceptable candidate has been identified by the committee. The Associate Director can offer additional fellowships if more than one outstanding candidate is identified and sufficient funds are available. confirmation of that the Division’s commitment of an assistantship shall continue. The Selection Committee reserves the right not to renew the fellowship in the event of unacceptable academic progress, insufficient course enrollment, insufficient research engagement, external employment or external fellowship. An example of this is failure to resolve academic probation within a semester. In case of questionable academic progress or other concerns, a transcript updated to include the most recent winter semester and Division’s plans to remediate the concerns will be required by 1 June.